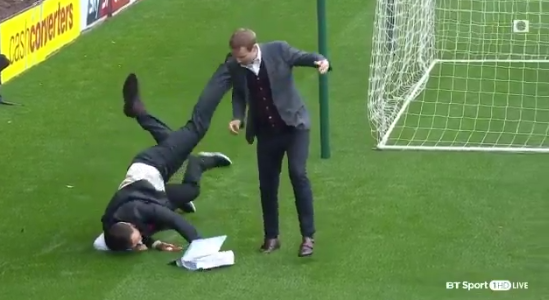 Former Celtic striker Chris Sutton, who now works as a pundit for BT Sport, was crunched on live TV by Stephen Craigan. Chris Sutton has made the move into punditry in recent years, where he seems to divide many, especially as he tends to have a few alternative opinions on the game. The Celtic legend was working for BT Sport and in deep discussion about the Old Firm derby before, out of nowhere, former Motherwell player Stephen Craigan took him out with a meaty challenge live on air, leaving him flat on the deck and, most probably, mightily embarrassed. Craigan and Sutton have been prone to a spat live on telly before but this certainly took it to a whole new level. ??? @chris_sutton73 is wiped out by Stephen Craigan!